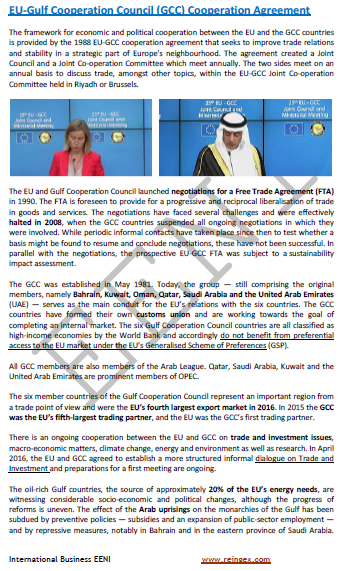 Syllabus of the Online Course (Subject): European Union-Gulf Cooperation Council (GCC) Free Trade Agreement. The European Union-Gulf Cooperation Council Cooperation Agreement would provide a progressive and reciprocal Trade in products and services liberalisation. The European Union established trade relations with the countries of the Gulf Cooperation Council (Bahrain, Kuwait, Oman, Qatar, Saudi Arabia, and the United Arab Emirates) through a Cooperation Agreement in 1988.
International trade in goods (Euros).